A follow-up to that last post on this. 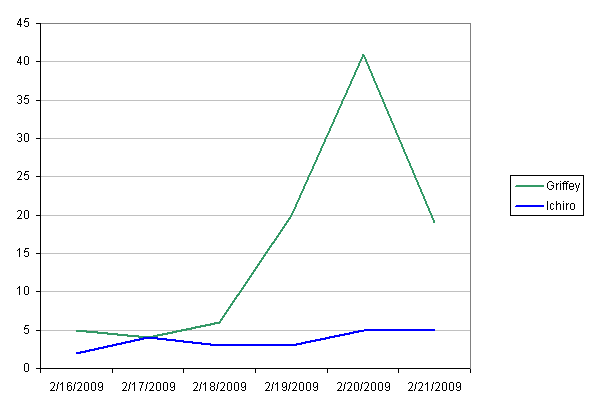 Here’s items on Craigslist with “Griffey” in them charted with “Ichiro” items (some showed up on both). The image might be clipped, so: Griffey items are in green, Ichiro items are in blue. Folks, if you’re looking for someone to give your Ichiro stuff to, please let me know. Whats the difference betweeen the green and blue lines? Now I’m sorry I burned all my Mariners gear after last season’s meltdown. Green is Griffey, blue is Ichiro. I think it’s craigslist items for each player. For a scientific view, now that Anderson has reportedly signed with the Braves, we should keep track of Garret’s stuff on eBay. I’m guessing it won’t take too much time to do.